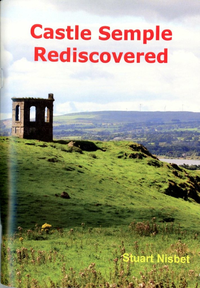 In 107 pages, Stuart plots the story of Castle Semple in the parish of Lochwinnoch. The book tells the story of the power and wealth of the Semple Family as it declined through the seventeenth century, particularly after the Union of Parliaments in 1707, Their decline coincided with the rise of the new west of Scotland colonial merchants. One of the merchants, William McDowall, a Scots-born Caribbean sugar planter, bought the Castle Semple estate in 1726. Through the eighteenth century, McDowall and his son and grandson developed a dual empire in the Caribbean and at Castle Semple.